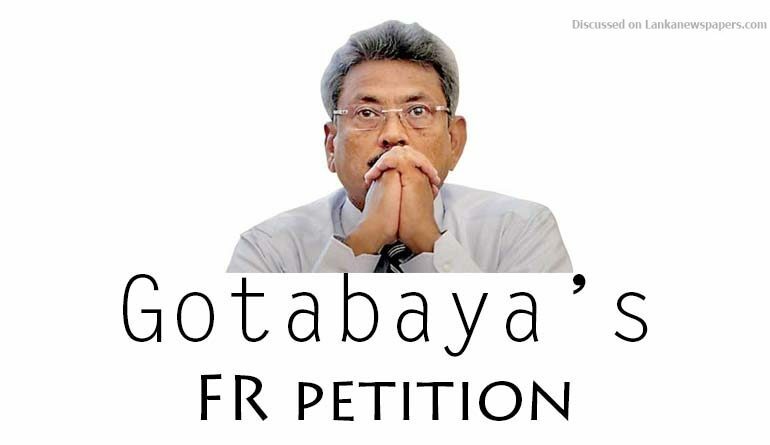 The Supreme Court yesterday re-fixed for 31 May the argument of the fundamental rights petition filed by former Defence Secretary Gotabaya Rajapaksa. The bench comprised Chief Justice Priyasath Dep and Justice Sisira J. De Abrew. When the matter came up on 24 October, Justice Eva Wanasundera declined to be a member of the bench hearing this fundamental rights petition. On that date, the bench comprising Justices Eva Wanasundera, K.T. Chitrasiri and Vijith K. Malalgoda had re-fixed the hearing for yesterday. Rajapaksa filed his fundamental rights petition seeking an order from the Court preventing the police from arresting him over several purported investigations and a declaration that the gazette notification on the Financial Crimes Investigation Division (FCID) was ultra vires. When the petition came up on 13 March, the Additional Solicitor General said that the investigation against him was continuing and that if there was a cognisable offence – meaning a police officer had the authority to make an arrest without a warrant and to start an investigation with or without the permission of a court – against him, the integral part of such an offence was a mandatory requirement to arrest. He, appearing for the respondents and the Attorney General, also told Court that the Interim Order preventing the FCID from arresting him granted on 13 May 2015 was still in operation. When the petition was in the first instance taken up on 13 May 2015 for support for granting leave to proceed, Justice Buwaneka Aluvihara had declined to be a member of the bench and the two-judge bench comprising justices Eva Wanasundera and Sarath de Abrew had granted an Interim Order preventing the FCID and others from arresting the former Defence Secretary for the alleged financial crime. They had also granted leave to proceed with his petition for the alleged imminent infringement of his fundamental rights to equality and equal protection by the law, to freedom from arbitrary arrest and detention as well as his right to the freedom of movement. Rajapaksa cited Prime Minister Ranil Wickremesinghe and the members of the Cabinet, Secretary to the Cabinet, Secretary to the President, IGP N.K. Ilangakoon, CID Director B.R.S.R. Nagahamulla, DIG of the Financial Crimes Investigation Division Ravi Waidyalankara and the Attorney General as respondents. Romesh de Silva PC with Ali Sabry PC, Sugath Caldera and Sanath Wijewardane appeared for the petitioner. K. Kanag Iswaran PC with Suren Fernando appeared for the Prime Minister. Additional Solicitor General Yasantha Kothagoda appeared for the respondents. Petitioner Rajapaksa filed the petition seeking an interim order preventing police from arresting him over several purported investigations and a declaration that the gazette notification on the Fraud Crimes Investigations Division was ultra vires. He states in his petition that the National Executive Council (NEC), its members in several newspapers and media channels conducted a malicious campaign against him and the members of his family alleging that they had staged a coup on the night of the elections to hold on to power contrary to the mandate of the people. The members of NEC who were instrumental in articulating the allegations continued with their efforts to make false and baseless allegations against him over the floating armoury which was found to have docked at the Galle harbour with a large consignment of weapons and ammunition, allegations of corruption and irregularities in the purchase of a MiG 27 in 2006, purported share manipulation at Lanka Hospitals Ltd. and the leasing of aircraft during the tenure of the Chairman at Mihin Lanka, he laments. The FCID was established to look into complaints forwarded by the Cabinet subcommittee under the patronage of the Prime Minister, who was also a member of the National Executive Council, he complains. In light of the complaints being forwarded by the subcommittee, there was a likelihood that the FCID was being biased and coerced and could make a finding adverse to him, he states.